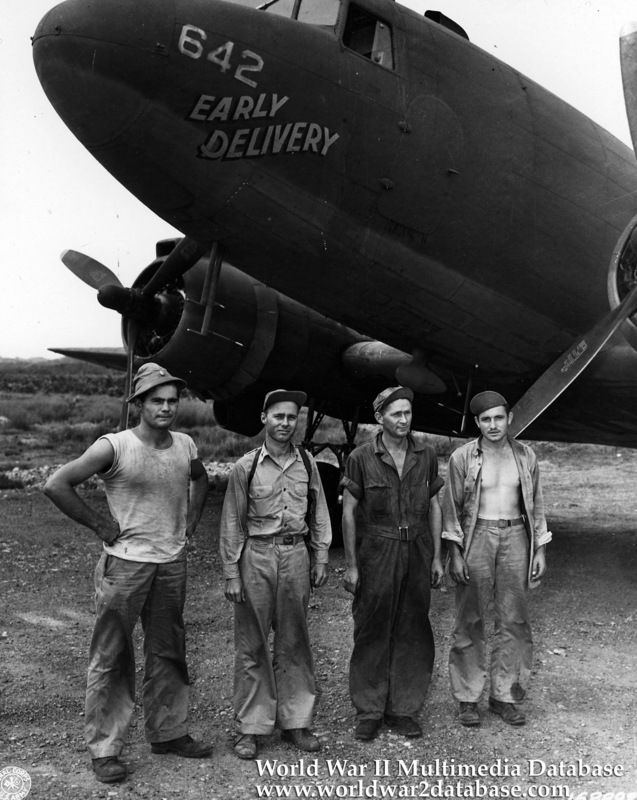 Crew of the "Early Delivery" tail number 41-38658 that supply the ground forces in New Guinea with equipment and foodstuffs. They are members of the USAAF's 5th Air Force, 347th Troop Carrier Group, 33rd Troop Carrier Squadron. This aircraft arrived in Australia on January 9, 1943, was assigned RAAF tail code VH-CGN and then was sent to Port Moresby. Left to right: Second Lieutenant Preston Holden, pilot, of West Union, West Virginia; Second Lieutenant John W. Foltz, pilot of Lima, Ohio; Corporal Emil W. Erickson, engineer, of Middle River, Minn.; and Private Clifford C. Fawn, radio operator, of Lewis Center, Ohio. On February 6, 1943, "Early Delivery" was one of three C-47s that took off from Jackson Air Base (7-Mile), Port Moresby at 0920 Hours on a routine flight to Wau. While the flight was circling Wau preparing to land, it was attacked by a number of enemy aircraft. The other two C-47s evaded them and landed, "Early Delivery" was shot down by Zeros and was missing in action. Discovered in August 1988 by Grant Malensek, a Canadian geologist with Australian mining company CRA Explorations. Crew remains were recovered by a team from Central Identification Laboratory Hawaii (CILHI) in 1989.